Mecca is a name well known in the world of bingo, the brand owns multiple land based bingo halls but they also have an online presence that maintains the great reputation with an impressive variety of games and friendly staff. 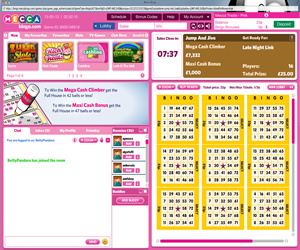 Mecca Bingo online has gone for the traditional pink colour scheme for bingo brands on their home page and you can see at first glance just a few of the games available should you choose to register and play with them. Registration is pretty straightforward and when signing with Mecca Bingo online you instantly gain access to a number of gaming wallets besides bingo; slots, games and of course, mobile. It may be that you are already a Mecca member as you play at your local hall, if this is the case then you can simply enter your membership number and the system will retrieve you details. Once registered you are ready to see exactly what the online arm of Mecca has to offer you. From the lobby you can see five tabs; 90 ball, 80 ball, 75 ball, Specials and All Rooms. The specials tab hosts additional games like the Community Slots options of Multi Balls, Clover Rollover and Marine Mayhem as well as special games like the Free and Superbooks options, Blockbuster Bingo, Deal or No Deal Bingo and Joker Jackpot. Mecca is home of exclusive themed bingo like the Blockbuster game, Britain's Got Talent Bingo and X Factor Bingo (some of these games can be seasonal though in line with the airing of the reality shows). The software used to power the bingo games at Mecca is the Virtue Fusion/Playtech product, which means for 75 ball you will find more than just pattern games on offer; you'll also find multi-part and multi-line games available. Navigating the bingo screen is really simple with easy to follow instructions, variable purchasing options and an abundance of friendly hosts to help you out should you find you have questions or a query. You'll find a while suite of casino style games available to play at the site too, some of which can be played in the same screen as your bingo whilst others are available from the Games tab. When it comes to jackpots you really are spoilt or choice here; in addition to the standard house prizes there are a selection of progressive jackpots both on bingo games and slots. For example there is the Mega Ball Booster that can be won if you call bingo in 33 numbers or less on a full house and the Maxi Cash Collector available if you call bingo in 38 numbers or less and these are just examples, there are plenty more available at Mecca Bingo! When it comes to promotions there is more than enough to keep you coming back to the brand for your bingo fix. Not only does Mecca offer quite an impressive new player bonus but the site also concentrates on player retention. This means their promotional schedule is constantly being updated. However, on-going promotions include the Bingo Linx jackpot games, an array of slot tournaments and free bingo. 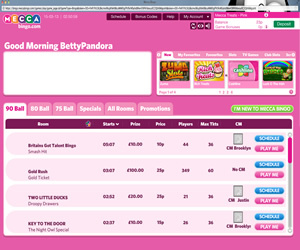 The online arm of Mecca Bingo does not let the brand name down, simply enhances it. 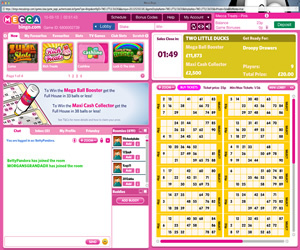 Mecca Bingo offers three different types of bingo game at their site. You are offered 75, 80 and 90 ball in a number of rooms. 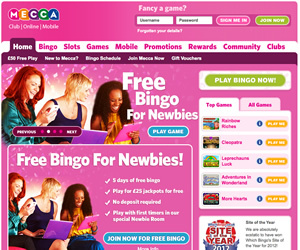 Additionally the site is home to themed bingo games, some exclusive to this brand, like Deal or No Deal Bingo, Blockbuster Bingo and Britain's Got Talent Bingo. The site offers a wide variety of instant win games, more than the usual Virtue Fusion offering but some are only available through the other gaming wallets. There are no specific wagering requirements at Mecca Bingo as the play through required to receive the bonus offered is consider the wagering requirements.